I’ve long been fascinated by corn yield and did my Masters and PhD research on this subject. The physiology of corn yield was a prime research interest during my former academic career in Crop Science at the University of Guelph. Most of the research on yield has featured above-ground plant parts – eg. higher and sustained rates of leaf photosynthesis, canopy morphology, timing of pollen shed and silk emergence, and higher harvest index (portion of above-ground dry matter in the grain at harvest). All of these are highly important. Improvements achieved both genetically and agronomically have meant that 300 bushels/acre (19t/ha) is now a realistic goal for some farmers, and 450 bu/acre (28t/ha) has been exceeded. During my tenure in Crop Science, I became increasingly interested in the role of corn roots and their interactions with soil. This was triggered, in part, by another personal research interest, soil tillage – and part by some anecdotal observations and quasi-research findings which were difficult/impossible to explain by conventional crop physiology. My career in research ended when I became full-time chief of staff for the Ontario Corn Producers’ Association in 1985. I did return briefly to the University of Guelph as adjunct professor in 2002, hoping I could pursue my interest in corn roots. But the system had changed: there were new (justifiable) charges for the use of almost anything – greenhouse bench space or whatever – and I had no enthusiasm for resuming the ‘chase for research dollars’ which I had left years before. So I did a lot of reading (actually relatively little literature on corn roots), and ultimately returned to more non-academic activities including increased attention to our family farm business. It’s obvious that further research on corn roots is no longer in my future, but the fascination remains. I’ll spell out below why and how I think roots are so critical to superior yields. Maybe others will pick up the challenge. Case 1. During our initial 24 years of farming, my wife and I harvested corn with an old-style picker, carefully screening out loose corn kernels as the ears went up a conveyor elevator into the corn crib. The loose kernels fell onto the ground a few metres from the crib, year-by-year adding to the soil organic matter in a band parallelling the crib. Eventually I noticed that the corn grown in this strip grew and developed much more quickly than did nearby plants. It silked about a week earlier, was much taller and yielded more. Initially, I assumed this was somehow a wind-barrier/warm-temperature effect. But one year the crib was not filled and the effect continued. It was not caused by warmer soil temperature since the soil in the favoured strip was wetter and likely colder. And it was not caused by higher fertility or better weed control. The only obvious explanation: higher soil organic matter meant a significantly higher rate of both growth and development in independent of temperature. We have not cribbed corn now for 18 years and the effect has largely disappeared. I suppose much of that organic matter has been oxidized, or spread elsewhere by tillage implements. Case 2. Nigel Fairey was my PhD student from 1972 to 1976 and his research project involved studying C14 labelled assimilate movement within developing corn plants. He grew corn plants outdoors but seeded in buried 22-litre perforated containers containing a granular baked-clay medium called ‘Turface,’ plus nutrient culture. Nigel also planted corn in the soil around the pots so that the treated plants would behave as if in a normal corn stand. One of his problems was that the corn plants in Turface grew and developed much more quickly than their neighbours. They silked 10 days earlier. The reason was unknown. Nigel checked and it was not differences in root-zone temperature. He solved the problem in year two by planting the bordering plants two weeks ahead of those in the pails. He got the data he needed, graduated and moved on to a productive career. But the puzzle of the accelerated growth remained. Case 3. In the late 1970s, I filled a large growth-room bench with corn grown in perforated pails containing Turface and regularly replenished nutrient solution. The plant density was high, about 10/m2 (equivalent to 100,000/ha) as I recall, and I recorded a yield (border plants near the bench edge not harvested) of nearly 200 bushels/acre. This was despite the fact the amount of daily visible radiation to which those plants were exposed was only about 20% of what field-grown plants would receive outdoors on a clear sunny day in mid July. This was back in an era when we struggled to grow 100 bu/acre on the Daynard farm. Case 4. In the mid 1980s, Dr. Madhava Reddy, a post-doctorate, grew corn plants indoors, suspended in pails containing aerated nutrient solution (no Turface), with half of them being subjected to a weekly regime of partial root tip removal using fingernail clippers. This was only a preliminary trial but the results showed a much slower rate of foliar growth and development for the tip-clipped plants despite the ample supply of nutrients, water and nutrients. The roots were obviously ‘annoyed,’ and this affected foliar growth and development in unknown ways. Both Madhava and I left U Guelph soon after so the work was not continued. Case 5 is more generic and involves the generally better rates of growth and development, and grain yield I and others see with corn grown in well-manured fields. Our neighbours, the Dupasquiers, grew great crops when they had dairy cattle manure to spread. Now with chicken manure, the crops are simply superb. I am also intrigued at how many high yield reports elsewhere are associated with ample applications of manure, especially poultry manure. So what’s going on here? Higher soil organic matter (manure addition, kernels dropping beside our corn crib) obviously has advantages in increasing available water storage and that will increase yield in most years. Nutrients from manure are also important, though that should not have been a yield factor in the cases listed above. The boost came using the biologically inert Turface as well as organic matter. The effect on rate of development is of special interest to me as I had long believed that heat accumulation to be the primary driver of rate of development (as compared to rate of growth – plant height, for example). But in some of the cases described above, above-ground rate plant development was affected by the root environment via some mechanism apparently independent of temperature – and sometimes in a dramatic way. 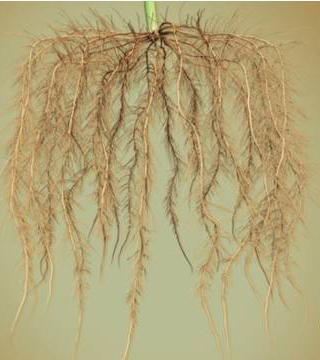 Plant physiologists know that stressed roots send chemical/hormonal signals to above ground parts which cause various physiological responses including reduced rates of growth. Abscissic acid is a key hormonal messenger of this type and there are others. But are there positive signals which roots send upward when they are essentially stress free? Signals which say the biological equivalent of “put the pedal to the metal”? Signals which will tell the plant to grow and develop more quickly, set more kernels, even more ears? And maybe which stimulate increases in rates of photosynthesis? In the months I spent as an adjunct professor, I spent much of my time in the library and on line, looking for published evidence of a “good times” hormonal signal – sadly, without success. Perhaps that’s because it’s hard to find, or perhaps no one has looked. Or perhaps the positive signal is simply the absence of stress-signal messengers. If it’s the latter, perhaps the “brakes” are almost always on, at least in part, for real-world corn plants. That’s a good thing for plants to survive in the normal world. But it’s not so good if the goal is record high yields. I recall an experiment performed by the late Bev Kay in Land Resource Science at Guelph, who grew young corn plants in stable soil aggregates (from a field growing red clover) of various size categories. Plants grew more quickly in soil consisting of fine aggregates (about 0.5 to 1 mm in diameter, as I recall) than with larger aggregates, and this was an effect independent of fertility or moisture supply. In checking the roots, Bev and his team found something intriguing: Corn roots in the finely aggregated soil grew straight. Those in larger-sized aggregates were wiggly. With smaller aggregates, the soil appeared to move out of the way as the roots lengthened. With larger aggregates the roots had to grow around. Farmers all know that compaction hurts yield. The most obvious means is by restricting root growth and access into areas of the soil containing needed water or nutrients, or by impeding water and air flow. But perhaps it also reduces yield just by impeding root growth itself, even if water, air, and nutrient supplies are fine. My wife is an excellent gardener, outdoors and in, and she regularly has to repot plants into larger pots or else they won’t grow and flower as they should. These plants are well watered and well fertilized, but still they do poorly when “root bound.” And what does root bound mean? Roots which are constantly running into each other or the container walls, and can only grow by turning – growing around things. Or consider Bonsai plant cultivation with trees permanently dwarfed by restricted root growth. Ontario farmer Dean Glenney at Dunnville Ontario has produced some really high corn yields and he plants his corn and soybeans in the same row positions year after year. He says that roots can grow easily down existing root channels. This fits my conjecture well. I’ve not met Dean personally, but understand that he also uses lots of poultry manure. The manure will also be great for reducing soil density and strength, making it easier for roots to grow unimpeded. Old root channels may be one of the biggest benefits for cover crops, i.e., in addition to drainage and aeration benefits – provided, of course, that these channels aren’t destroyed by subsequent tillage and heavy equipment tramping on wet soils. It’s an untested hypothesis. I’ve spent hours thinking about ways to test this. Dr. Amélie Gaudin completed a PhD thesis recently in Plant Agriculture, University of Guelph, growing corn plants aerobically with roots dangling in a mist of nutrient solution. Her study was about genetic differences between corn and ancestral teosinte, but maybe the same system could be used to study the effects of impediments to root growth independent of water, nutrient and air supply. The challenge would be to introduce barriers/impediments in such a way that they force roots to bend around obstacles but don’t lead to stressful oxygen deprivation. Maybe there are other creative ways to test my conjecture. To close: I’ve no proof – nothing would stand up to good peer reviewing – only a collection of anecdotal and quasi-research results pointing in a certain direction. But if you really want to be the farmer who breaks above 500-bu/acre corn yield – or even 50 bu/acre better than what you’re doing today, figure out how to encourage unimpeded root growth. And if you can sort out how to do this in a cost-effective manner (not everyone has huge poultry manure supplies, and Turface is way too expensive), you could become a very wealthy person. A European acquaintance quizzed me recently about crop rotation and tillage practices for major crops in Ontario. I’ve prepared the following. And, since it might be also of interest to others too, I am posting it on the web. This is a very simplified overview of Ontario cropping systems. Readers should recognize that each farmer does things somewhat differently, and farming practices continue to evolve quickly. 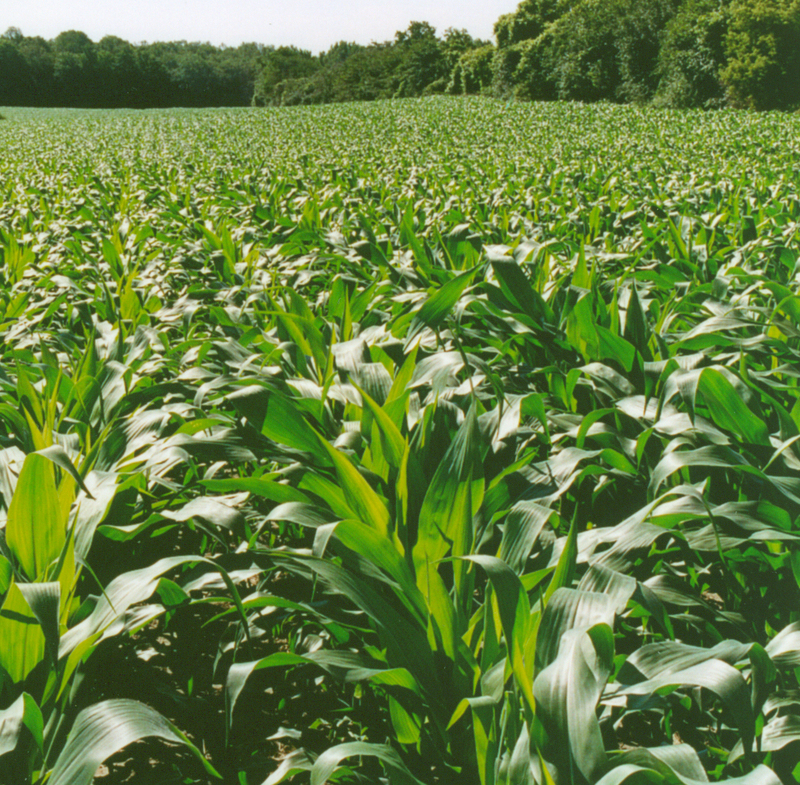 The principal field crops in Ontario are corn, soybeans and perennial forages – about 2 million+ acres of each. This column is mainly about corn and soybeans, and also wheat which is grown on about 1 million acres – and mainly about those farmers who are primarily grain growers. Perennial forages are mostly grown by farmers who raise cattle, sheep, goats and horses. 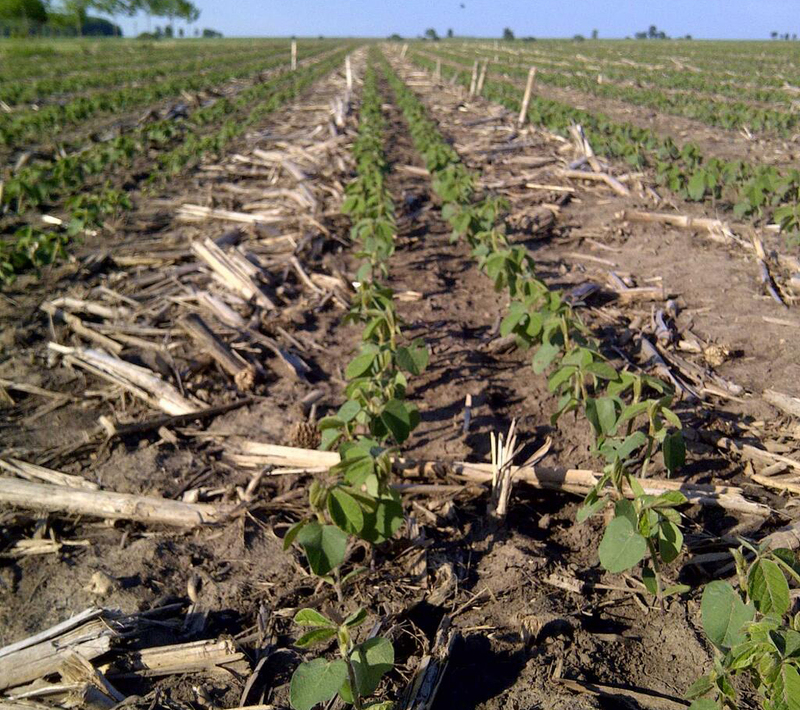 Soybeans have been grown in extreme southwestern Ontario (warmest part of the province) since the early 1900s. Production blossomed across the rest of Southern Ontario during the 1980s. This was because of the availability of better early-maturing varieties and the need for a profitable cropping alternative to break the pattern of continuous corn production. (This is sometimes called ‘mono-cropping,’ though ‘mono-cropping’ can have other meanings too and is an ambiguous term). Many Ontario grain farmers add a third crop to the rotation – fall-seeded wheat, which is commonly called winter wheat. While wheat is usually not as profitable a ‘cash crop’ as corn and soybeans, farmers grow wheat because it spreads out their annual work load, provides diversity and stability (weather-vulnerable growth stages for wheat occur at different times of the year than for corn and soybeans), and because research data have shown that corn yields benefit significantly from having wheat in the rotation. (Wheat has a fine root structure which contrasts with the generally coarser roots of corn.) Wheat also represents an over-winter cover crop, to help limit soil erosion in early spring runoff (lots of water runs off the soil surface because of melting snow and rainfall). Corn rootworm larvae are commonly a serious problem when corn follows corn. This necessitates the use of insecticides or the use of Bt-corn-rootworm-resistant corn hybrids. Corn rootworm has also become a problem in corn-soybean rotations in the United States. However, the problem does not occur with corn-soybean-wheat rotations. Farmers are concerned about protecting their soil from erosion (primarily water erosion in Ontario), and in maintaining/improving soil organic matter levels and soil structure. 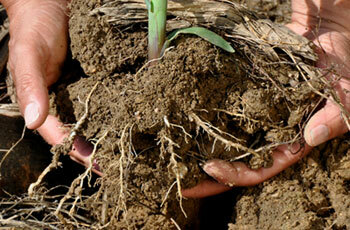 Good soil structure makes root growth easier and facilitates internal water and air movement. Reduced soil tillage (often this means no tillage at all except for the possible preparation of a very small mini ‘seed bed’ right around the planted seed) is one means of doing that. It also reduces the cost of farming (less equipment, less time for field operations, and less fuel usage). 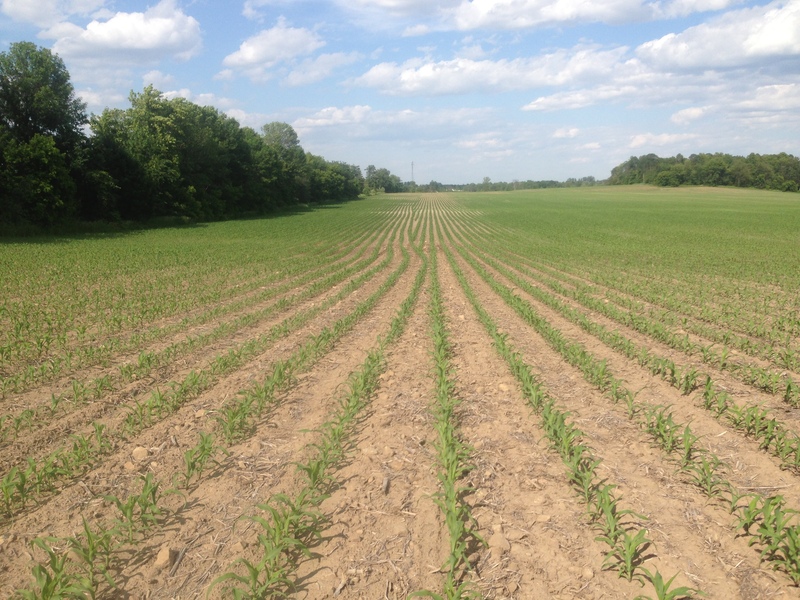 Corn crop residues are especially valuable for protecting soil from erosion (i.e., if left on the surface and not plowed under). This is because of both their high quantity (about 9 tonnes/ha for a good average corn crop) and their slow rate of decomposition. They can stick around on the soil surface for 2-3 years. 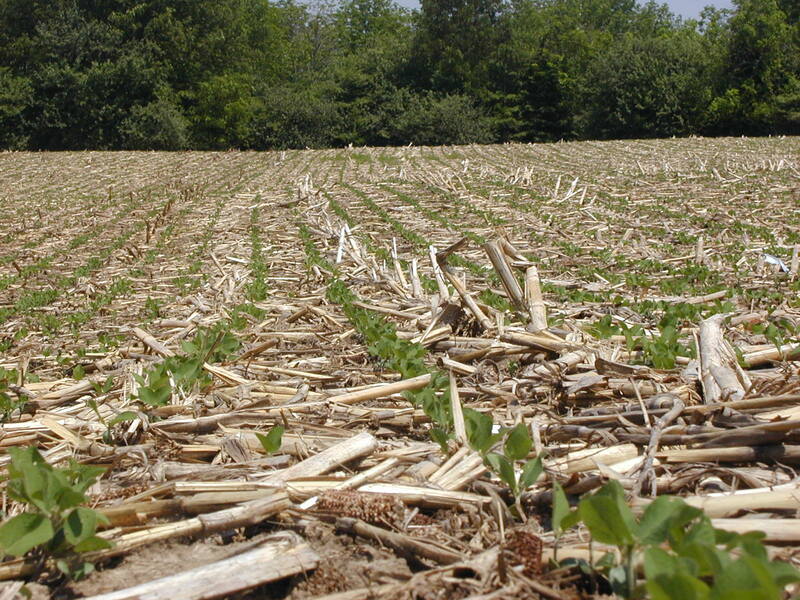 By contrast, soybean crop residues decompose quite quickly after harvest time and in the following spring. 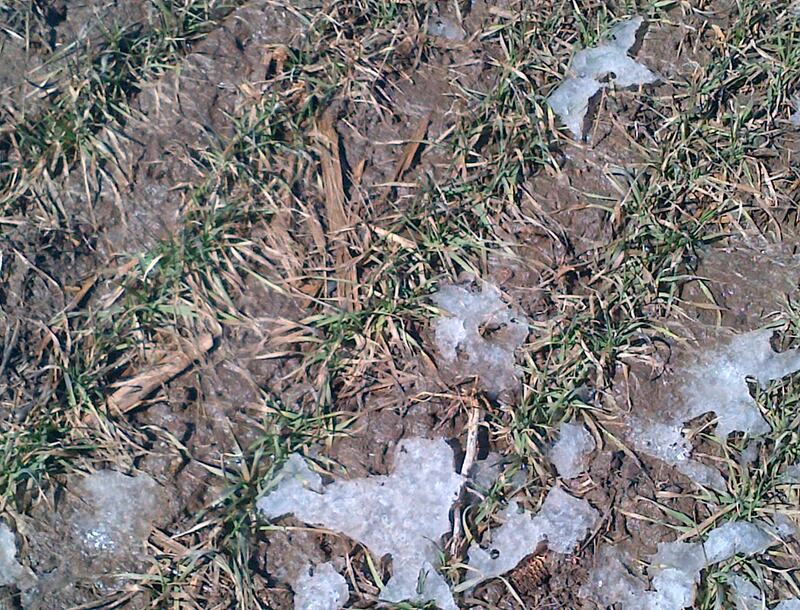 This is one reason why farmers commonly plant winter wheat immediately after soybean harvest to protect the soil surface. Winter wheat presents its own soil problems – mainly because it is harvested during midsummer (commonly in July), leaving the soil surface ‘unprotected’ for many months to follow. Wheat straw residue helps. But, at least in North America, it is not as plentiful as what remains after corn. Many farmers plant special cover crop species. The most common is red clover for which the seed is spread on winter wheat fields in early spring. This allows red clover plants to germinate and then subsist until the wheat is harvested; after harvest they usually flourish until growth stops with the arrival of colder weather in October. 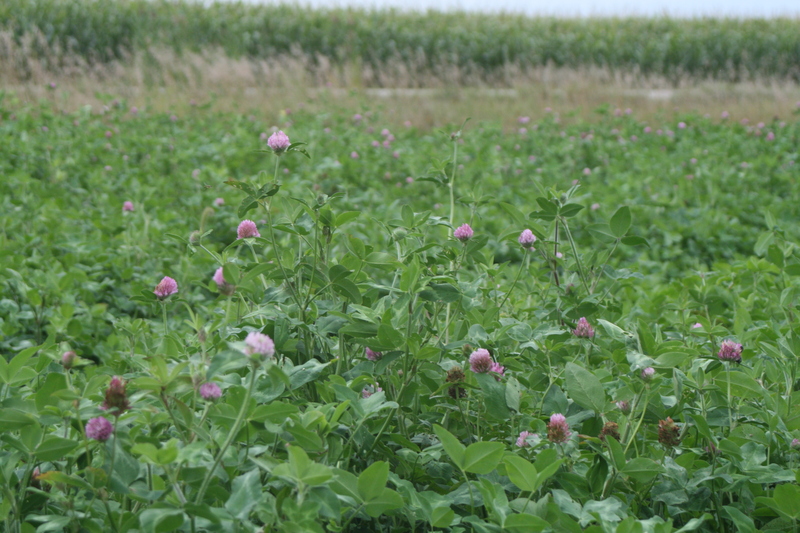 Red clover cover crops protect the soil surface from erosion while adding soil organic matter and nitrogen fertility (red clover is a legume). The crop which follows wheat/red-clover is usually corn. Some farmers will plant other cover-crop species after the wheat is harvested, usually using ‘no-till’ seeders for reasons of speed and minimal soil disturbance. Early spring planting presents some challenges – and a need for compromise. Complete surface coverage is best for erosion control but it can mean slower drying of soil in spring. (Most Ontario soils begin each spring fully saturated with water, because of late-autumn and early-spring rainfall, and snow melt.) This is a special problem for corn which generally yields best when planted early. This is especially true for slow-drying clay soils. 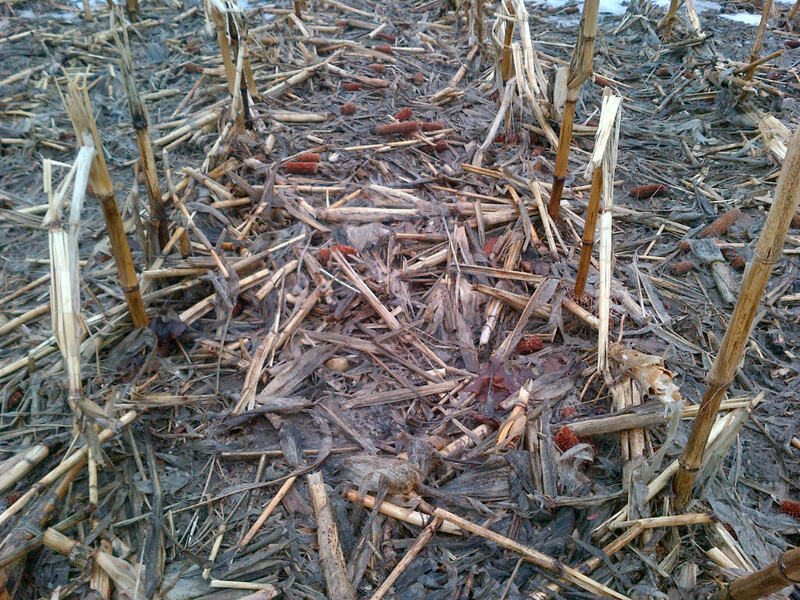 If residue coverage is really dense, some farmers will try to incorporate some residue into the soil with autumn tillage. Some farmers use strip tillage equipment to work a narrow strip (either in the fall, or a day or two before spring planting), thus allowing soil in the strip to dry out faster to permit early planting. 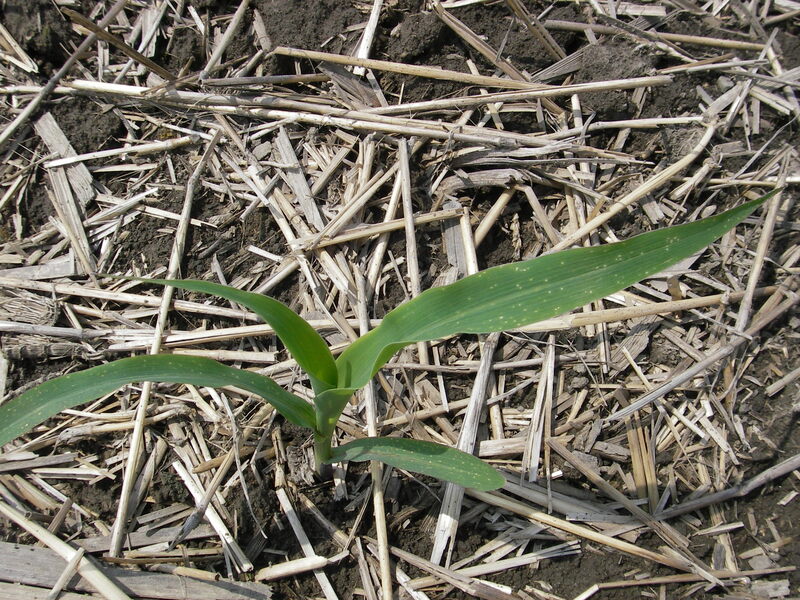 If soil is planted when too wet, it ‘smears’ during planting operations and this can have a very negative effect on corn seedling growth and final yield. GPS technology allows farms to plant corn into the centre of the tilled strips. 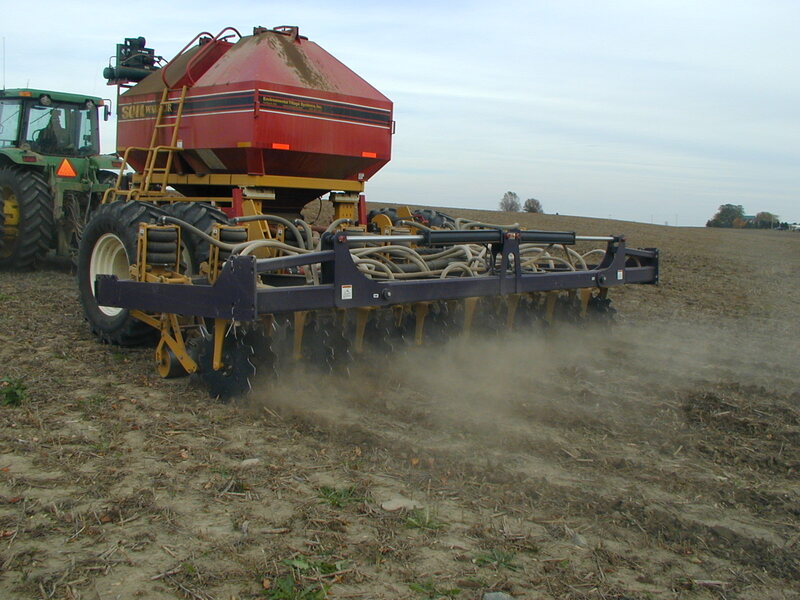 In addition most no-till planters have attachments which move residues a few cm to either side of the planted row. This permits sunshine penetration to the soil above the planted seed, and quicker germination. In some countries (notably north-western Europe), garden slugs will flourish with abundant soil surface organic matter coverage. Slugs eat the emerging crop plants. This is occasionally a problem in Ontario too. Emerging plants in springtime in Ontario are also vulnerable to occasional late frosts, and this risk is magnified with lots of soil residue cover. It’s a trade off, with most farmers considering that the increased risk of frost damage is more than off-set by better soil quality and higher yields with ample soil residue cover, over a period of years. Pest control is very important to the success of reduced and no-till cropping programs which allow for the abundant presence of soil surface residues. Fungicide and (usually) insecticide treatments are generally needed to protect planted seeds and emerging seedlings from diseases and insects which flourish in conditions of cool, damp soil and surface residue cover. Herbicides are needed for the weed control which was traditionally done by soil tillage. Organic farmers, who cannot use synthetic pesticides, often counter these insect and disease challenges by planting a little later and by using tillage implements for weed control which penetrate the soil only shallowly. While a few organic farmers and researchers are currently exploring options for the elimination of tillage, no-till organic farming remains largely unknown.